As a Reseller, you can use your own domain to rebrand the URL of all your accounts. 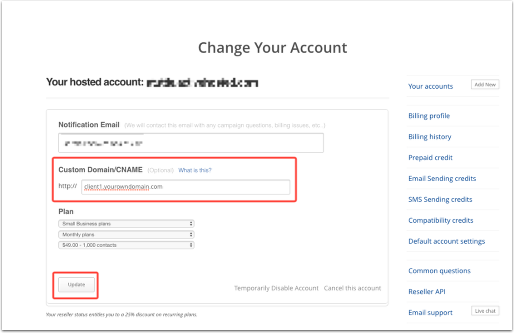 To do this, you would need to create a CNAME for each of the accounts you create. Each of your accounts will use a subdomain of your domain. Instead of the default youraccount.activehosted.com URL, you can use something like client1.yourowndomain.com. Any links generated from your account will reflect your domain alias. In order to use a custom domain with ActiveCampaign, you would first need to set up a DNS record for a CNAME (or Canonical Name) with your domain registrar or hosting provider. To illustrate, we will be using a Godaddy account to add a CNAME. 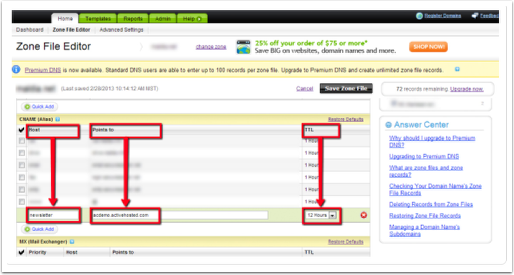 The instructions below are specific to Godaddy and your own hosting provider may have a different set of instructions. Click the “Manage DNS” link. Click Add and select CNAME from the dropdown list. Name: the sub-domain of the site. Ex. if your site is yourdomain.com, you can type in newsletter under host to have the newsletter.yourdomain.com URL. Value: type in your ActiveCampaign.com account. Ex. acdemo.activehosted.com. TTL: Time to Live, you can put in 43200 (for seconds) or 12 (for hours). Log in to your Reseller Dashboard. Look for the account and click the down caret on the right of the account. Click on the “Change” link. Type in the Domain Alias you created from Step 1 under the Custom Domain/CNAME field. Then, click the “Update” button. Note that it can take up to 48 hours for changes to take effect. If your CNAME does not work right away, it probably has not propagated yet. You can use a wildcard domain for accounts that share the same domain. If you use a wildcard domain (for example, "*.activehosted.com"), then you will need to configure where it points to in your DNS. Note that these steps are for GoDaddy. Steps may vary with your DNS provider. Host: The host name should be set to the wildcard (" * "). Points to: This is the URL you are setting as the destination for the host. You will need to type managed-cname-fallback.activehosted.com in this field.